LC-MS is one of the most commonly used analytical techniques in various sectors for quantitation and identification of unknown from variety of complex samples. Use of LC-MS has expanded over the years as it offers both selectivity and specificity in analysis. With advances in both chromatography and mass spectrometry, sensitivity and accuracy of this technique has further increased, allowing for detection and identification of low-level analytes in complex sample matrices. 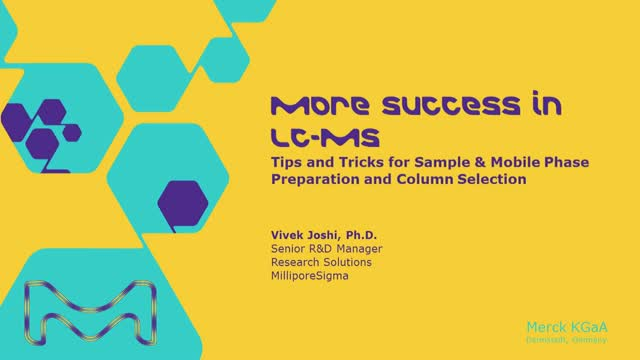 The LC-MS workflow has three main components, which determine successful analyses: sample preparation, choice of mobile phase components and column selection. Not paying enough attention to one of these components can complicate data analysis, quantitation and identification. In this seminar, you will learn critical factors to consider when selecting the sample preparation methods, mobile phase components and HPLC columns. Have you ever found yourself wondering which clone of Napsin A to use? What about PAX-8? Or the ongoing dilemma of ordering a mouse monoclonal vs rabbit polyclonal? Then this webinar is for you! In this presentation we will explore how antibody's are produced in their corresponding hosts. From there we will identify the main differences between the most popular types of antibodies, including mouse and rabbit monoclonals, and rabbit polyclonals. We will then compare the performance of specific clones that are backed by NordiQC data. We hope this will aid in choosing the best clone for your IHC tests. It’s no secret that we live in a celebrity centric culture hungry for the latest news about our favorite famous faces. This lecture will employ the fascinating world of celebrities to introduce the immunohistochemical grid approach to cancer disease states. We will specifically use cancer stories from past and present entertainers, athletes, and politicians to examine the histological characteristics and statistics that define various tumor types. These cases will also be our launching pad as we take a deep dive into the intricate world of tumor immunophenotyping by highlighting recent antibody additions and their impact on modern detection. Attendees will learn the utility of these new antibodies and gain a better overall understating of how diagnostic grids are used by pathologists to provide thorough and accurate patient care. Evolutions des référentiels qualité et crises sanitaires, comment le nettoyage et la désinfection apportent des réponses aux changements majeurs. Nous présenterons les solutions de contrôle rapide du nettoyage allant des méthodes conventionnelles microbiologiques aux méthodes rapides en passant par le contrôle de l’air. Biomagnetic separation has proven to be a quick, efficient and clean process in Life Sciences. However, most researchers and developers focus only on the magnetic beads or particles to optimize their separation process. The effectivity of the biomagnetic separation depending on the magnetic carrier is only half of the story. To have the complete picture we also need to pay attention to the role of the applied magnetic field on the play. Not understanding or controlling the parameters linked to the magnetic separator will result in failure when developing new applications, and also in industrializing lab-scale developments. The webinar will review the basic concepts of magnetic separation and help the attendees understand how advanced systems may enlight key aspects of the process. These concepts will be applied to parameterize, monitor and validate the magnetic beads behavior in controlled conditions. Afterwards, the discussion will focus on how to transfer the correctly characterized biomagnetic separation process from laboratory to production scale. Finally, the webinar will address how to use this knowledge to assure the quality of the magnetic-carriers based products. Sergio Barberan-Soler, Ph.D., Director of Sequencing Technologies, SomaGenics, Inc. The ability to accurately quantify all microRNAs (miRNAs) in a sample is not only important for understanding miRNA biology, but for the development of new biomarkers and therapeutic targets. SomaGenics has developed the RealSeq®-AC library preparation kit – a new method for preparing miRNA sequencing libraries that involves ligating the miRNAs with a single adapter and circularizing the ligation products. When compared to other methods, the RealSeq®-AC kit provides greatly reduced miRNA sequencing bias and allows the identification of the largest variety of miRNAs in biological samples. This reduced bias also allows robust quantification of miRNAs present in samples across a wide range of RNA input levels. Immunohistochemistry has now been a staple in diagnostic pathology for decades. This is partially due to pathologist utilization of antibodies in the realm of specialty panels. As the science evolves, the panels evolve, creating demand for the next generation of antibodies to improve diagnostic capabilities. This talk will give an overview of some of these novel diagnostic markers and how they fit into the specialty panels with the traditional antibodies to provide the best diagnostic capabilities to the pathologist, therefore giving the patient the best care available. For Pesticide Analysis in food and feed QuEChERS is an established Sample Preparation technique. Nonetheless there are some challenging sample matrices that require variations of the classical QuEChERS methodology. These are fat-rich matrices, intensively coloured matrices and dry, complex matrices such as teas, spices or herbs. As even the variations in the official methods AOAC 2007.01 and EN 15662:2008 cannot fully remove all matrix interferences, this talk will introduce new sample preparation approaches leading to improved clean-up and recovery of pesticides in these challenging matrices. Cell culture in 3D systems: moving from 2D to 3D cell culture? It’s now well accepted by the scientific community that the 3D cell culture condition better recapitulate the in vivo environment and behaviours of cells. But it’s not a trivial change to move from 2D cell culture conditions to 3D, and not always easy to choose the right system to use. An understanding of the key parameters for 2D and 3D cell culture will be reviewed, followed by an overview of the technologies available at Merck with features, benefits, and application data. E. coli is the most widely used recombinant expression system to overexpress protein given that it is inexpensive, easy to scale up, and relatively fast. Due to its wide-spread use, there are numerous molecular tools, products, and expression/purification protocols available. Determining which tools and products to use, such as plasmid, strain-type, affinity tag and resin system, or buffer exchange device can be daunting. Here, we present a workflow overview of the recombinant protein expression from E. coli and provide insight and various tips and tricks about how to optimize and improve protein yield and purity enabling you to make the best decisions for your protein of interest. Professor Lawrence Wangh, Founder and CSO of ThermaGenix, Inc.
3. ThermaStop™-RT: a first-in-class reagent that acts like a hot-start for many reverse transcriptases. Each reagent is a chemically modified oligonucleotide produced under GMP conditions and sold as a dry powder. Stable at room temperature, each reagent can simply be added to the enzyme of your choice prior to adding that enzyme/reagent complex to the master mix. These improvements are observed for both inexpensive Type A Taq polymerases and very expensive HiFi Type B DNA polymerases in applications such as qPCR, multiplexing, and preparation of DNA amplicons prior to next-generation sequencing (NGS). From tissue processing to slide coverslipping, the histology workflow is laden with hazardous steps. Chemical sensitizers, strong acids, alkaline substances, and oxidizing agents are routinely used during histological workflows. These classes of chemicals are known to damage and even destroy living tissues. Ensuring the safety of laboratory workers is of the utmost importance. This workshop will present new approaches to help make the histopathology laboratory a safer environment with the use of formalin-free fixatives, phenol-free stains, DBP-free mounting media, IVD-certified ready-to-use reagents, and more. The Life Science Business of Merck KGaA, Darmstadt, Germany Webinar Channel features scientific presentations from key specialists in analytical chemistry, biology, chemistry and life sciences on the practical and technical aspects of new developments and innovations, to help advance your research.